A person votes at a polling station inside the Teatro Frida Kahlo Theater, March 7, 2017, in Los Angeles. Documentary proof of citizenship requirements and illegal voter purges are voter suppression measures aimed at keeping eligible Americans from participating in elections and having their voices heard. Many states have made great advances in lowering barriers to voter registration, providing a gateway to voter participation through tools such as automatic voter registration, same-day registration, and online voter registration.2 Unfortunately, many states are using voter registration tricks that manipulate the voter rolls and keep eligible Americans from having their voices heard. This report looks at two of the worst practices used to block eligible voters from participation: documentary proof of citizenship requirements, where people must show evidence of citizenship in order to become registered to vote, and illegal voter purges. Like other forms of voter suppression, both of these practices close off the democratic process to wide swaths of eligible Americans. As this report shows, improper changes to voter rolls and barriers to voting registration such as those favored by Kobach would be enormously detrimental to American voters, particularly people of color and other historically underrepresented communities. Those such as Kobach who support documentary proof of citizenship requirements and conduct voter purges claim that these sort of measures are necessary to prevent supposed illegal voting, despite overwhelming evidence that shows illegal voting is extremely rare.16 Even President Trump’s own lawyers have stated, “All available evidence suggests that the 2016 general election was not tainted by fraud or mistake.”17 Instead, the true purpose of this commission is to constrain voter participation by making the process of registering to vote and casting ballots more difficult, particularly for certain groups. This is a cowardly, illegitimate power grab, no more than a scheme to maintain power for a select few. 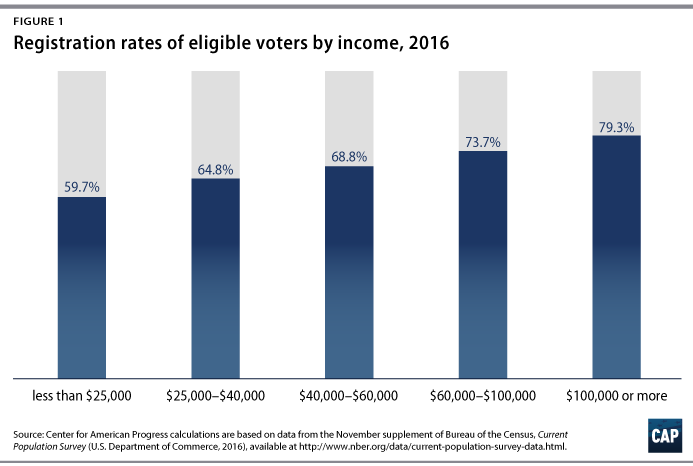 We must keep up the fight for the right to vote for all eligible Americans if we want a thriving, robust democracy that works for all. Documentary proof of citizenship laws force eligible Americans to overcome unnecessary barriers by requiring them to produce expensive and difficult to obtain documentation—such as a birth certificate, a passport, or naturalization papers—before registering to vote. One survey found that as many as 7 percent of American citizens, 13 million in all, do not have easy access to these kinds of documents.30 Documentary proof of citizenship requirements are particularly damaging for people of color, low-income Americans, and young and elderly people, who are less likely to own or obtain these documents. These laws threaten the right and ability of eligible Americans to participate in our elections and offend basic democratic principles of fairness and equality. Documentary proof of citizenship laws threaten to roll back a century’s worth of progress in removing barriers so that eligible people of color can exercise their right to vote and make their voices heard. Documentary proof of citizenship requirements strike at our country’s foundation of political equality by penalizing people for being poor—taking away their right to vote by forcing them to choose between paying for expensive citizenship documentation and supporting their families. To be clear, it is not illegal to be registered in more than one state or for dead people to appear on voter rolls. Voter purges can happen in several different ways, as detailed below. But what they all have in common is that they almost always have a disproportionately negative impact on communities of color. The improper removal of eligible voters may result from a state’s reliance on inaccurate or unreliable databases. Reportedly, President Trump’s sham commission plans to check state voter rolls against the Systematic Alien Verification for Entitlements (SAVE) program.75 SAVE is run by the U.S. Department of Homeland Security (DHS) and is used to verify immigration status for the purposes of determining eligibility for public benefits. Purging may also occur through a process known as “caging,” whereby groups target certain communities by sending out mass direct mailings to registered voters through mail that cannot be forwarded. Any attempt by the Trump administration to make it harder to register voters or easier to remove eligible voters from voter rolls will prevent Americans from exercising power and having their voices heard. Indeed, as explained by U.S. District Court Judge for the District of North Carolina Loretta C. Biggs, “electoral integrity is enhanced, not diminished, when all citizens who are eligible to vote are allowed to exercise that right free from interference and burden unnecessarily imposed by others.”106 Voter registration lists can be properly maintained to ensure they are secure and accurate without violating the voting rights of eligible Americans. To accomplish this, this report recommends that states take the following actions. Automatic voter registration offers a secure, modern way to use data efficiently to protect the integrity of voter rolls and facilitate voter participation. With AVR, a state updates or adds eligible people to its voter registration rolls using information it already has on file, unless the individual chooses not to become registered to vote or to have his or her address updated.107 An individual who is registered through AVR has his or her voter registration updated automatically when they move, making it easy for the millions of Americans who change residence each year to maintain accurate voter registrations.108 AVR also improves the security of the nation’s election rolls and prevents errors in registration, since it removes the guesswork that comes from having to decipher applicant handwriting and clerical errors that occur in the traditional data entry process. Oregon’s first-in-the-nation AVR program proved a resounding success in increasing voter registration and participation amongst eligible Americans in 2016. Additionally, new analysis shows that those registered through Oregon’s AVR system were younger, more rural, and more diverse compared with traditional registrants.109 Thus, in addition to streamlining the voter registration process for voters and election administrators and making voter rolls more accurate and secure, AVR strengthens our democracy by opening up the democratic process to groups historically blocked from participating due to barriers in the voter registration system. Russia’s interference in the 2016 presidential election, including attempts to hack at least 21 state and local election systems, was an assault on our democracy.116 While there is no evidence that Russia tampered with vote totals, there is also no telling what it may do in the future as its methods become more sophisticated. As warned by cybersecurity expert J. Alex Halderman, professor of computer science in the University of Michigan College of Engineering and director of the Center for Computer Security and Society, “there is no doubt that Russia has the technical ability to commit widescale attacks against our voting system, as do other hostile nations.”117 Former FBI Director James Comey has warned that the Russians “will be back.”118 Foreign interference in America’s elections undermines the integrity of our democracy and prevents us from governing ourselves freely. Cybersecurity experts who have studied U.S. voting machines have found “severe vulnerabilities that would allow attackers to sabotage machines and to alter votes.”119 The Russian hacks in the 2016 election serve as a wake-up call for the dire need to begin investing in updating our electoral infrastructure to keep our elections safe from future malicious attacks. 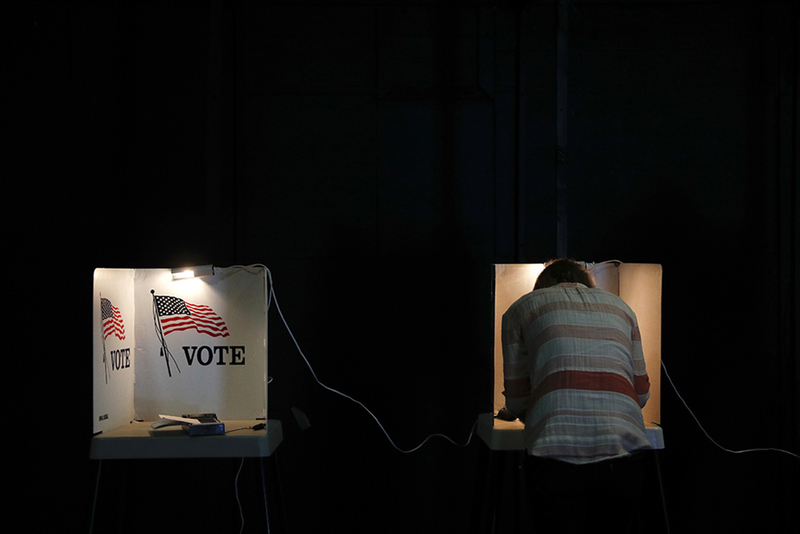 These measures include updating outdated voting machinery and technology, implementing minimum cybersecurity standards, and instituting voter verified paper trails and mandatory audits. Instead of wasting time and resources on a sham voter commission, the Trump administration should be putting into place safeguards to protect against the real threat that foreign interference poses to our elections and American voters. The right to vote transcends partisan politics and is essential for our democracy to function. The NVRA was originally passed on a bipartisan basis, with both Democrats and Republicans alike recognizing the importance of protecting the ability of all eligible Americans, regardless of political affiliation, to have their voices heard on Election Day.121 By fully enforcing the NVRA, implementing programs such as AVR and ERIC, and investing in the security of our election infrastructure, states can enhance the overall security of our voter rolls, while making sure that all eligible Americans are able to exercise their fundamental right to vote. Rather than wasting time and taxpayer money on a fruitless investigation of American voters and questioning the integrity of the voter registration process, the Trump administration should focus on supporting programs aimed at increasing access, removing barriers, and ensuring that the American people can fully exercise their right to participate in our democracy. At a time when our democracy is under attack by foreign powers seeking to influence our elections and infiltrate our voter lists, we must find ways to safeguard the electoral process and the fundamental right to vote. The NVRA plays an essential role in expanding participation and fighting against voter suppression tactics in the states. States have an important part to play in combating dangerous rhetoric and action by the federal government. Responsible leaders should refuse to cooperate with the dangerous overreach of the sham commission. Instead, states should expand access to the voting booth for Americans by ensuring that the National Voter Registration Act is fully enforced and encouraging legislatures to implement automatic voter registration and to participate in the Election Registration Information Center exchange. Danielle Root is the voting rights manager for the Democracy and Government team at the Center.